Now that we have a solid sense of our typical household spending, as covered in a previous article in this series, it’s the time to take a first stab at the adventure travel budget. The most common questions I receive on my adventure travels are “How much does it cost?” and “How can you afford to do this?”. The questions are rarely the first out of someone’s mouth, but after some time, often just before the conversation ends, most ask some version of these money focused questions. To most, the idea of dropping out of the workforce for months or years to pursue adventure seems financially impossible, especially if you have kids. Shifting the mindset of fantasy to reality takes practical planning, and planning involves taking the time to estimate the adventure travel budget. Over the six month period from April 2015 to September 2015, we calculated in the last article that our average monthly expense totaled $15,401.60. Below is a snapshot of the proportions of our spending by category for these months, and in the table further down we show the relevant dollar amounts. When we estimate the expenses that we can expect while traveling, we have to take into account a number of overarching factors for the unique circumstances of our family adventure trip. You will need to do the same for whatever adventure you are planning. Taking a first pass at the numbers around an adventure travel budget is largely an exercise in common sense guessing and refining. Using our typical monthly spend as the basis and our understanding of our adventure trip and lifestyle requirements, we can start to determine what expenses we could cut, modify, or replace on our adventure. We’re targeting $10,000 monthly spend, a rather large number since we are servicing four mortgages and considering our monthly mutual fund investment an expense. Don’t let the $10,000 per month discourage you, if it does, as our actual adventure is being done for less than $4,000 per month. $6,000 dollars of this monthly spend goes towards the mortgages on four houses and a mutual fund, which are completely optional to maintain while we travel. We could always sell the houses and stop the investing. Since we are maintaining them, I do have to keep them in my budget, just life any other obligation one might have (i.e. union dues, college debt payments, cell phone bill). We’ll discuss more of the real estate and investment strategy later. So after the initial pass, we are a little bit above our target monthly budget of $10,000. Prior to travel, the budget is a living document. As we gather more information about the adventure, and as we curb our normal habits in every day life, as discussed in the previous article about cutting current expenses, we should be updating the budget to ensure it closely reflects reality. The biggest test for me after first creating an adventure travel budget is a common sense test. Given current spending habits and knowledge of the adventure to come, does the budget make sense. Am I cutting too much for a given category? Increasing too much? Not considering some aspect of the adventure that will be an added cost that I simply don’t have in my regular life? I cycle through these questions to see if I’m on the right track. The biggest expense we removed from our budget is childcare, which removed $2,344 dollars per month. Does this make sense? Yes, we’ll be taking care of our own kids. For the home category, the reduction is largely a result of cutting expenses for home bills, small improvements, and random Lowe’s trips. The remaining money reflects the cost to cover all mortgages, taxes, insurances, and HOAs for our home and various rental properties. This still makes sense. We cut consumption in food and dining by 45%. This budgetary number includes groceries equivalent to our typical monthly spend, but it eliminates almost all restaurants. Makes sense, but maybe a little aggressive. For the cuts in the shopping category, we will be significantly reducing random purchases that had become a part of our normal life, such as new clothes, toys, and such, and the remaining budget will be used for needed gear and clothing replacements. For the most part, you can expect that your consumption habits while traveling will gravitate towards your typical consumption habits when not traveling. You’ll likely want to buy the same brand foods and drinks at the grocery store. You’ll likely indulge a similar amount, consuming a similar amount of coffee, beer, and treats. There may be expenses that can be clearly eliminated or reduced in the planning, such as a mortgage, child care, and house related expenses, depending on your circumstances. There will also be opportunities for curbing your lifestyle to reduce costs, such as reducing the urge to dine out at restaurants, visit coffee shops, or buy new clothes. For certain there are ways to reduce costs, but it takes energy and discipline to modify your lifestyle choices, so we find it is better to budget for moderate change, ensuring that you are planning your itinerary and saving the right amount of money for the anticipated spend. If you are planning on dramatic changes, then attempt to make the changes before you leave on your adventure. This way, if the change fails to meet expectations, then you can accommodate it in your budget before you leave. An added advantage of budgeting for moderate change, if you do happen to develop more frugal spending habits while you travel, then you have budget surplus, giving you the upside to spend money elsewhere. When you embark on an adventure, you will incur costs not normally associated with your daily life. These may be hard to spot, but the more research you do about your anticipated adventure, then the more likely you are to identify those expenses and build them into the budget. In our situation, our lifestyle is changing in a pretty dramatic way in that we are becoming nomadic. As a result, we have dramatically increased the amount we expect to spend each month on car and RV expenses and fuel. For our cross country trip, we’re estimating that we will burn two tanks of fuel per week. One tank to get from one campsite to another, and then another tank to run errands and explore for the week. Pile on the increased oil changes and unexpected repairs, and we expect a 215% increase in auto and fuel related costs. We also feel the need to increase our monthly spend on entertainment. After all, we are embarking on the adventure to have fun with the family. We will be taking advantage of as many free, fun family activities as possible, such as hiking, beaches, and swimming, but we expect we will pay for some museums, zoos, tours, and the occasional movie. For travel and lodging, our pre-adventure travel costs included the occasional weekend trip to the beach or trip to another city. On our trip, we’re expecting an increased frequency in spending on travel and lodging related items. However, since we’re staying at parks or wild camping, we’re expecting relatively lower nightly spend, and we’re targeting about $20 per night based on our research. 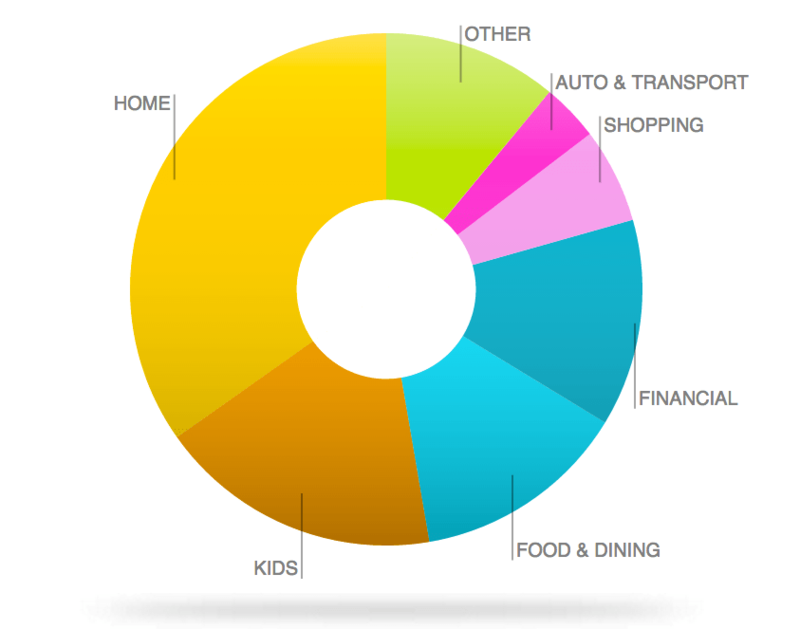 You may notice that more than half of our budgeted monthly expenses, $6,046, are going towards real estate and investments. We will cover our real estate and stock investments in a separate article, but the short version of this strategy is that rents cover the mortgages and the investments aren’t pure expenses, as investments are assets, which are eventually used to buy more real estate. If we did not have four houses and a desire to maintain our investments, then our monthly adventure travel budget target would be closer to $4,000 to cover all other categories, including auto and fuel, gear, food, and lodging. Aside from our mortgage payments, we do not have any debt. We do not have car loans, student loans, or credit card debt. Our mortgage debt services itself through rent. Debt that cannot be serviced in such a way can certainly make adventure travel more difficult to attempt and sustain. We strongly encourage you to rid yourself of consumer debt before quitting a job to travel. Sell the cars and pay off the difference, if any. Pay off or settle the credit card debt. The student loans may not need to be paid in full, but you will need to account for the monthly loan payments in your monthly budget. For more about eliminating debt, check out an earlier article in this series on Managing Debt Before Adventure Travel. What should you do about YOUR budget? You should download this tool that we built. Use this tool to start making some realistic projections about the money that you need to spend to fund the requirements for your particular adventure and your desired lifestyle. Nail down how much you think you will need to spend on a monthly basis to live out your adventure travel dream. Once you’ve filled out this calculator, you have the first draft of your budget. You should be constantly revisiting the budget before your trip, modifying the numbers as you learn more about the adventure trip and your lifestyle. Now that you have a budget, it’s time to start saving to fund your adventure. Thank you , me and my brother Josh, of no blood kin, have decide we are going to start here in Louisiana drive to where the Mississippi River, divides the land. Then swim across ,then walk the tripple crown starting the AT ,would like to go pro the quest of perspectives, being aware of the word of God and living as intended, as the earth was presented. Won’t to stop by nursing homes and talk to everyone there abt life.telling them we are going to try to do all the things that are considered great, as in walking the tripple crown , hang gliding, etc. sword fighting in Rome as a gladiator, these is what were doing don’t know exactly all hills to top but that’s not the issues where not doing it for gain but to show LOVE ,so we have no differences of one accord . Actively looking for someone to help the AT is the first task,after we swim the divide, wisdom of the spirit will set us free ,I’m ready to start walking back home , called by my true name that I haven’t heard, in what feels like 300 years, We walk the crown for you. Will have very little funds but no bills. And will never use flashlights so we are not blinded.see with our eyes and hear with our ears. Sounds great, Drew. Check out the Adventure Sponsorships we have.